Sl. No. Name of Topic Page No. Even though there are a number of Hospital in Bangladesh, most people do not get the proper medication here and children are the major victims of this situation. The death rate of children are high not only because of the lack of treatment but also because the R & D departments of pharmaceutical companies in Bangladesh what are not that much developed to find new molecules to treat those children. There are lots of diseases that are responsible for the death of children and among those diseases; Diarrhea is in leading position in our country. Research has shown that zinc has a very effective impact on diarrhea for those children who are under five. Zinc treatment reduces the duration of diarrhea as well as the probability of future episodes of diarrhea and the necessity of hospitalization. From this point of view ACME is trying to establish this zinc as the format of Baby Zinc. Although ACME is trying to develop awareness about Baby Zinc, some people are not taking it seriously. They cannot accept something new for their babies except ORS during diarrhea. Even though the sales report of ACME shows that the sales volume of Baby Zinc is progressive they found that there are many areas in Dhaka City and other districts where people are not that much aware of Baby Zinc. So, my study will help ACME to fill up the gaps in their promotional activities and also help them to find out the new ideas to spread their message and create more awareness among people regarding Baby Zinc and its usage. to find out the factors which are creating this problem and to find out solutions. to help ACME in its way to spread the message of Baby Zinc and aware people to buy and take this during diarrhea. This paper has been written on the basis of secondary date collected from ICDDR,B & The ACME Laboratories Ltd. I have visited several chemist shops in Dhaka City to know how much positive is their attitude to Baby Zinc. I also visited The Dhaka Shishu Hospital & 02 (two) childcare clinics to survey prescriptions in order to know whether the doctors are prescribing Baby Zinc along with ORS or not. I also got some data & information from Internet & SUZY News (published by ICDDR,B). I also applied observation method to gather information about the organization. Personal interviews also took place in order to gather information about the marketing, promotional tools, and marketing strategies of Baby Zinc to prepare this report. Here I have used only the secondary data that is theoretical approaches. I have not got all exact information from the personnel of The ACME Laboratories Ltd. due to the company secrecy. The people of chemist shops were not so cooperative to provide information. As I could not survey among the parents or caretakers to know the acceptance of Baby Zinc to them with ORS, so I had to depend on the data got from ICDDR,B. I had to report to my supervisor everyday and sign the logbook to keep record of my working days. Keep up with the training schedule that they have provided me. Gather information about the organization through conversation with other employees. Keeping notes about the discussion, prepare a summary of that particular topic and show it to the supervisor for correction. If any correction is required, then make the correction and again show it to the person who provided me with that information. Sometimes report to the Head of PMD, if any problem is faced. Everyday collect information about Baby Zinc. Collect information about the promotional strategy of Baby Zinc from the Product Officer of that medicine. Report to In-charge about the progress of jobs. Collect and analyze sales data of Baby Zinc. Discuss and identify the problem with Baby Zinc marketing. At ACME I used desktop computer to search and record data about ACME, Baby Zinc etc. I also used printer to print the recorded and downloaded information. Sometimes I used photocopy machine to copy some documents provided by supervisor. I used telephone to inform my supervisor and to reschedule the training program. Product management procedure of ACME. How to promote Pharma Products. Promotional tools of Baby Zinc. Training as a part of marketing. Functions of Product Management Department (PMD). Market development in the global arena. Pricing policy of ACME Laboratories Ltd. The history of The ACME Laboratories Ltd. dates back to 1954 when a proprietorship firm was founded to manufacture ethical drugs. It started with the modest introduction of a few oral liquid products. The late Hamidur Rahman Sinha was the founder of the firm and was the main visionary of the organization until his sad demise in 1994. This department is responsible for taking the products beyond the regional boundaries after satisfying the local demand. They constantly look for new marketin the global arena and relentlessly work to create a positive image about their product in the minds of international customers.  Setting the price for the first time. 1. Samples: In traditional style pharmaceutical marketing, the company generally promotes its new product by providing free samples to doctors and physicians who can read about it, learn about its features and are free to test it on their patients. 2. Writing Pads: This is a useful form of promotion in that it helps to inform, convince and remind the doctors about the products and its features every time they open the writing pad to write something down. 3. Gift Items: This can be of a wide variety starting from pens, mugs, and paperweights to decoration pieces. These products are usually given as presents to doctors, physicians and sometimes pharmacists to serve as an incentive, reminder about the product. These gift items are given along with the literature and / or the pad. 4. Literature: This gives a detailed description of the various features of the product, its contents, recommended dosage, advantages and disadvantages a user can get from using the product etc. It aims to differentiate the product from other competition and emphasize the products differentiating features. 5. Discounts: This promotional measure is directed towards chemists or pharmacist. These discounts are given at various times during the life cycle of a product. They are given to encourage the chemist to increase orders for the product. There are many ways this can work for the pharmaceutical company. On the one hand, the price advantage entices chemists to buy this product instead of its competitors. Once they stock up on a particular product they will recommend the product to customers and even convince customers to buy that particular product instead of any other product of the same use. Chemists do this because they would want to finish its stock of that product which they bought to take advantage of the discount and also because they would make more profit by selling the discounted product rather than a non-discounted one. Another bonus given to chemists comes in the form of gifts. For example, if a chemist buys TK. 10,000 worth of goods from the company, they are given a dinner set or a wall clock as a gift. Considering the importance of zinc treatment for childhood diarrhoea, the Ministry of Health & Family Planning revised its policy guidelines and has included zinc treatment as the second golden rule, right after ORS. 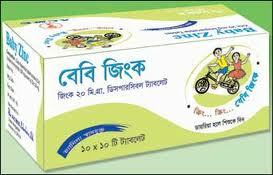 The addition of zinc tablet with ORS will help to reduce child mortality due to diarrhoea. 1. Give the liquid food repeatedly. 2. Give Zinc dispersible tablet. doctor or nearest health care center. To ensure the use of zinc tablet in diarrhoea for children throughout Bangladesh, the Health Ministry in collaboration with ICDDR,B has provided training to all Civil Surgeons & Upazila Health & Family Planning Officers (UHFPO) & after that it has given free Baby Zinc tablets to all Government Hospitals & THCs.